KRK have added a couple of new two-way active monitors to their range, both of which provide full coverage of the audio spectrum in a nearfield format. Both also feature the same one-inch soft-dome tweeter and a bass/mid-range driver that utilises an aramid glass-fibre cone, the main difference being that the smaller monitor has a five-inch bass/mid-range driver, while the larger has an eight-inch bass/mid-range driver. As you might imagine, this allows the larger Rokit 8 to produce more level and to reproduce lower frequencies, the quoted response being 45Hz-20kHz ±1.5dB. The smaller five-inch unit still manages a respectable 53Hz-20kHz ±2dB, so either will cover the normal musical spectrum very adequately. KRK originally made their reputation by building Kevlar-coned speakers, but the woven glass-fibre composite used on their lower-cost models still combines physical strength and stiffness with good self damping, which in turns helps deliver a tighter sound. These particular models are very efficient, which means they don't need massive internal power amplifiers. The Rokit 5 has just 15W driving the tweeter and 30W powering the mid-range/bass, while the Rokit 8 has 20W feeding the tweeter and 70W available to the mid-range/bass driver. The crossover frequencies for the smaller and larger models are 3kHz and 2.4kHz (using fourth-order filters) respectively and, because the cabinets are ported, subsonic filters are included to attenuate frequencies below the cutoff point of the cabinet. These operate at 45Hz and 35Hz respectively. Neither model is particularly large, with the Rokit 5 measuring just 28 x 19 x 23cm and the Rokit 8 38 x 27 x 32cm. The Rokit 5s weight 14Ibs each, while the Rokit 8s are almost twice as heavy at 27lbs each. Both feature the same general styling, with a slot-shaped bass port at the bottom of the baffle and a moulded surround in which both the bass/mid-range driver and the tweeter are recessed, the tweeter sitting in a contoured depression designed to help control its directivity. An LED in the Rokit logo shows that the speakers are powered up, and the mains rocker switch is on the rear panel next to the IEC mains inlet. 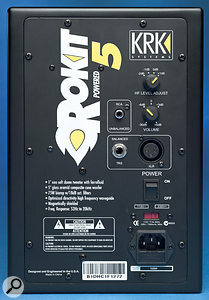 The rear panels of the Rokit 5 and Rokit 8 offer identical connectivity and configuration controls.Photo: Mark EwingThe rear panel facilities are the same for both models, with an input level control (-30dB to +6dB gain range) and a four-position rotary switch for high-frequency adjustment. Here, a shelving filter with a 2kHz turnover frequency can be switched to allow 1dB of boost, flat response, 1dB of cut, or 2dB of cut. Audio inputs can be accommodated on unbalanced RCA phono, balanced TRS jack, or conventionally wired balanced XLR connectors. Both models have cabinets made from high-density particle board, with rounded corners to help avoid diffraction. The styling is both simple and attractive, with yellow speaker cones and logos. My first tests were performed using the larger Rokit 8s, which in my garage-sized studio delivered a punchy, well-balanced sound with the kind of very slightly forward quality that most users find desirable in a studio monitor. In comparison with my own Mackie HR824s, which use similarly sized drivers, I didn't feel the Rokit 8s were quite as revealing or as extended in the deep bass, but they were still very comfortable to work with and seemed very capable of delivering properly balanced mixes with a perfectly adequate level of bass. They also have that useful characteristic that lets you hear into a mix so that you can focus on individual sounds. Although the Rokit 5s are rather small by comparison, and have a less extended bass response, they still deliver a solid punch and avoid sounding boxy at moderate listening levels. Moreover, the bass isn't hyped up to emphasise only kick drums. These speakers would be a good choice for a small studio, where the room isn't particularly well-behaved at very low frequencies, but in an average sized room I'd still prefer to work with the Rokit 8s, which are also capable of higher sound levels. The technical spec doesn't mention a maximum SPL, but I got more than enough clean level for my own tastes. These may not be KRK's most expensive monitors, but they are ideally suited to the majority of project studio applications, delivering clarity and a decent amount of bass extension in a compact and affordable package. I really liked working with the Rokit 8s, but when switching to the Rokit 5s there was no sense of being fobbed off with a small sound — these are great little monitors for this UK price. All speakers built to a cost involve design compromises, but I feel the designers have done well in this respect to deliver a range of well-engineered, affordable active monitors with no significant vices. Whatever corners have been cut, they don't affect the ability of these monitors to let you hear a properly balanced mix with clarity and detail. Open, detailed sound with good bass extension. While not at the very bottom of the price range for active monitors in the UK, these models from KRK offer great value and deliver an honest and well-balanced sound in a typical project studio environment. Rokit 5 £239 per pair. Rokit 8 £399 per pair. Prices include VAT.